The source of water is a series of 11 wells — seven vertical and four angled — that tap into the Missouri: Elk Point Aquifer. 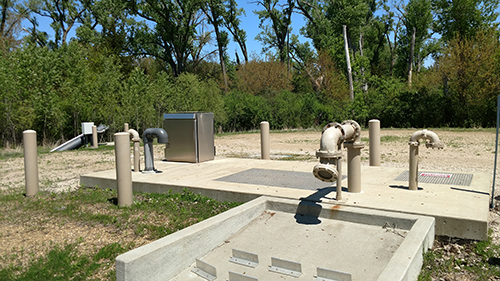 This aquifer is hydraulically connected to the Missouri River; the greatest natural water resource in SD. The main wellfield is in an area known as Mulberry Point, just north of the Vermillion-Newcastle Bridge southwest of Vermillion, SD. It is part of SD Department of Game, Fish & Park’s Frost Production Area. There are three wells at Site A, three wells at Site C, three at Site D and two at Site E. One or more wells will be built in the future at Site B, and possibly elsewhere, as demands require. Most are a stone’s throw from the river. Protecting them from erosion is a one mile bank stabilization system called a “modified stone toe revetment”. The steep river bank was sloped, rip rap was placed and covered with soil, and planted with vegetation. This environmentally friendly approach to bank stabilization received the distinguished “Partners in Conservation Award” from the Department of the Interior in May 2009. “Firm capacity” describes how much water can be pumped with the highest yielding well out of production. The current firm capacity of the well field is approximately 33 million gallons a day. There is no intake pipe pulling water directly from the river, so the result is a very high quality water that has been filtered by the sand and gravel. For regulatory purposes the water is considered “ground water”, as opposed to “ground water under the influence of surface water”. Water rights are provided through the State of SD. Shallow aquifers like the one Lewis & Clark uses can be susceptible to contamination due to activities on and around the overlaying ground surface. After lengthy studies with the SD Geological Survey, in 2016 Lewis & Clark staff worked with Clay County and the City of Vermillion to have the land in close proximity to the Mulberry Point wellfield reclassified as Zone A. This designation provides the highest level of protection against potential surface contamination currently available through ordinances.